Beautiful stucco home in the heart of Palisade Wine Country! 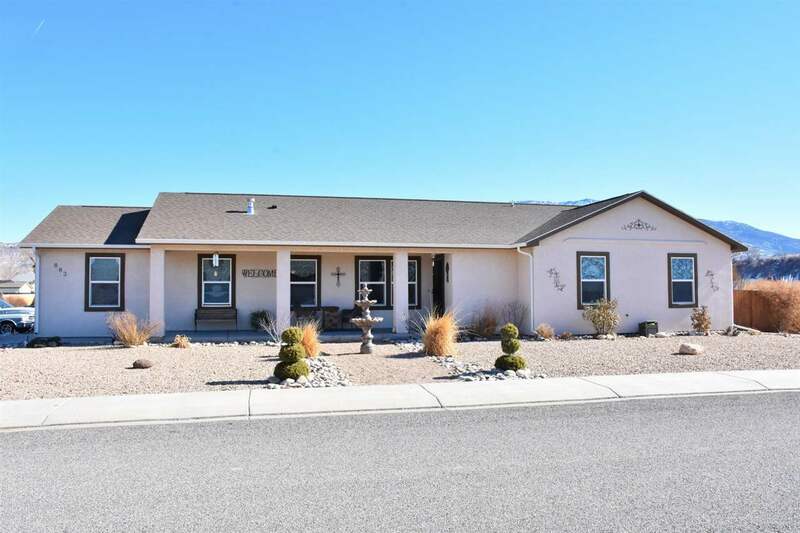 This home boasts FABULOUS panoramic views of the Grand Mesa and Mt Garfield from the great corner lot location in family friendly neighborhood that abuts open space! Xeriscaped front yard and lush backyard with mature landscaping and irrigation water. Two sheds included; one storage shed doubles as a bonus room/studio that comes complete with extra insulation and outdoor viewing window! Interior boasts a large living area that flows seamlessly into the kitchen that features lovely glass tile back splash, plenty of cabinet storage and eat-in dining area. Large 22 x 24 two-car HEATED garage. This home is Energy Star rated and boasts extra insulation in the attic and walls! Convenient location to visit Palisade&apos;s premier wineries, walk to hometown festivals with ease and close proximity to Palisade&apos;s top rated schools!